The Universal Declaration of Human Rights provides in article 1 that: ‘[a]ll human beings are born free and equal in dignity and rights’. Several other international human rights instruments have similar clauses on nondiscrimination. The elaborate legal framework notwithstanding, persons with disabilities continue to experience multiple forms of discrimination and exclusion. 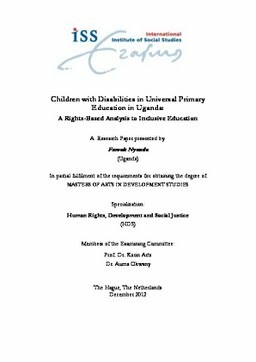 This study looked at the right to education for children with disabilities in Uganda who, despite the inclusive label of Universal Primary Education, continue to get peripheral benefits from the programme. This paper contains five chapters. Chapter one introduces the subject of the research – highlighting the background of inclusive education and Uganda’s efforts thus far; justifications of the research; and research methodology, among others. Chapter two discusses the concept of disability with specific reference being made to the dominant models of understanding disability i.e. the Medical/Individual and the Social models which, by and large, play a key contributory role in either excluding or including persons with disability. The chapter also delves in detail the right to education in which the rightsbased approach is analysed, pointing out States responsibilities to realise the right to education. Chapter three highlights the current practices under UPE to include CWDs. How effective how they been? Chapter four, from a rights-based perspective attempts to identify possible interventions that might have to be taken in order to make UPE meaningful to its beneficiaries especially the CWDs. Chapter five makes a recap of the study, particularly noting State’s obligations under international human rights law to realise human rights. Unless the State enforces its obligations under the right to education, the future of CWDs may be compromised.